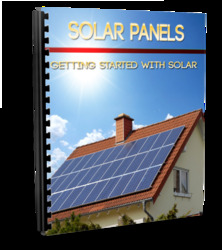 The gas - vapor mixture of greatest practical importance is the air - water system1. The thermodynamic behavior of this mixture affects the weather and engineered devices such as air conditioners. In these applications, air can be treated as an inert ideal gas. 1 Reference 1 (p. 252) gives a short discussion of gas-vapor mixtures. The onset of liquid water condensation is illustrated in the p-T diagram of Fig. 5.3. The unsaturated air in state 1 has a relative humidity given by pw/psat,w(T1), where pw is specified. 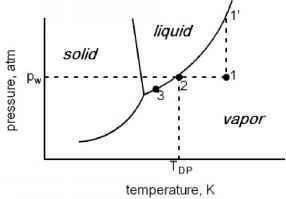 psat,w(T1) is located at point 1' on the liquid-vapor co-existence curve. When this gas is cooled at constant total pressure, both pw and pa remain constant until the saturation curve at state 2 is reached. The temperature at state 2 is the dew point given by Eq (5.14). Upon further cooling from state 2 to state 3, water condenses from the gas, pw (now equal to psat,w) decreases as determined by Eq (5.13), and pa increases to keep the total pressure constant. The following example illustrates this process in detail. Example: Unsaturated air is cooled from state 1 to state 3 in a piston/cylinder container maintained at a constant pressure of 1 atm. (c) heat removed from the container per mole of air during cooling from state 1 to state 2 and from state 2 to state 3. (a) The saturation pressure associated with the air temperature of state 1 is on the liquid-vapor curve in Fig. 5.3 (point 1') directly above point 1. As calculated from Eq (5.13) for Ti = 35.2oC (308.2 K), psat1 = 0.0568 atm. The relative humidity is 70%, so Eq (5.12) gives pw1 = 0.0398 atm. Because the air is just saturated in state 2, the water partial pressure does not change on cooling from 1 to 2 and psat2 = pw2 = pw1. The dew point of air with this partial pressure of water lies on the saturation curve at state 2 in Fig. 5.3. From Eq (5.14), T2 = Tdp = 301.9 K (28.9oC). 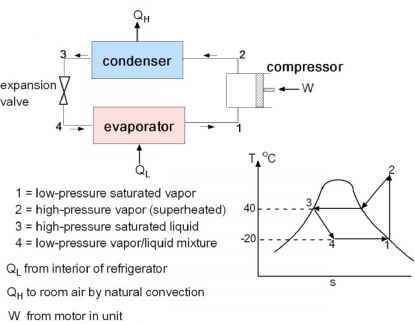 What is gas mixture in thermodynamics?